After playing USTA League tennis for more than 25 years and never advancing to nationals, Gainesville’s Bobbie Mehan suddenly has a family full of national championship contenders in 2011. 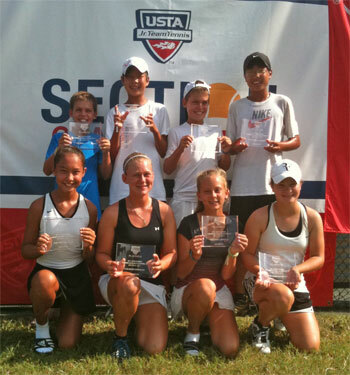 In the same year Mehan, her sister and her daughter are all advancing to USTA League National Championships in Arizona. Mehan, the QuickStart 10 and Under Tennis director and assistant pro at the Jonesville Tennis Center in Gainesville, Fla., began playing USTA League tennis out of college in Kansas City. Then it was league tennis in Chicago, Atlanta, and for the last 10 years in Florida. 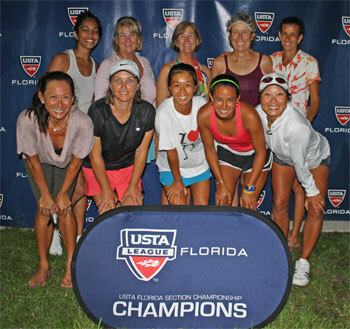 Her women’s 45-and-over team, including sister Bonnie O’Brien, were unlikely USTA Florida Section champions until enduring a series of tiebreak wins during a rainy weekend at the USTA Florida Adult League Championships in July at the Florida Tennis Center in Daytona Beach. The sisters Bobbie and Bonnie have played tennis together since high school when their team won the state championship. Bonnie will be the lone player on the team with previous USTA League National Championship experience. One tradition for USTA teams advancing to league nationals is to present the other teams with a gift, and the Gainesville resident is attempting to keep her Florida Gators football passion in check. “We’re going to come up with something great to represent Florida — I think we should give something ‘Gators,’ something Gator-ish, but we are representing Florida and not just Gainesville,” Mehan said, laughing. The team roster also includes Ekanong Van Roy, Larissa Williamson, Mary Cribb, Elizabeth Amdur, Jean Vaughn, Kar Yee Fransham, Preetika Pai, Barbara Rozboril, Kathy Bevis, Margot Markowitz, Deborah Hubbart, Zhoe Solaun, Sierra Solaun, Debbie Bowers and Sandra Phillips. Also advancing to USTA Jr. Team Tennis Nationals in the 14-Advanced division is Mehan’s daughter Lillie. For the 14-year-old Lillie it’s also a first-time trip to nationals after much of her team recently moved up from the 12-Advanced division. “This will be the first time going to nationals for everyone on the team,” said Lillie, who adds the team has already planned their wardrobe changes. Now all that’s left for the family is figuring out flights and stay-overs in Arizona to support one another. The 2011 USTA League 4.5 Adult National Championships will be held Oct. 28-30, 2011 at the Reffkin Tennis Center in Tucson, Ariz., while the 2011 USTA Jr. Team Tennis 14-U National Championships will be held Oct. 20-23 at The Surprise Tennis and Racquet Complex in Surprise, Ariz.